A business man got on an elevator in a building. When he entered the elevator, there was a blonde already inside and she greeted him by saying, "T-G-I-F" (letters only). He smiled at her and replied, "S-H-I-T" (letters only)." She looked at him, puzzled, and said, "T-G-I-F" again. He acknowledged her remark again by answering, "S-H-I-T."
The blond was trying to be friendly, so she smiled her biggest smile and said as sweetly as possibly "T-G-I-F" another time. 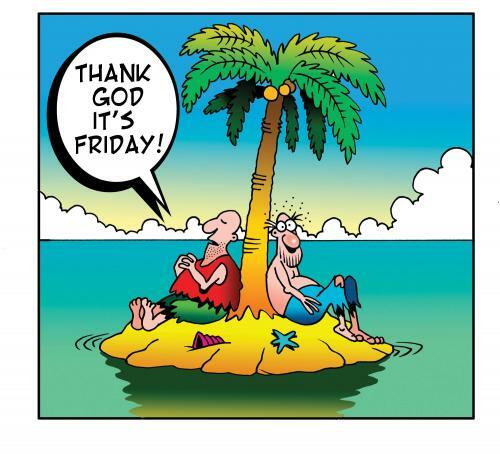 The man smiled back to her and once again replied with a quizzical expression, "S-H-I-T."
The blond finally decided to explain things, and this time she said, "T-G-I-F, Thank Goodness It's Friday, get it?" The man answered, "Sorry, Honey, It's Thursday."